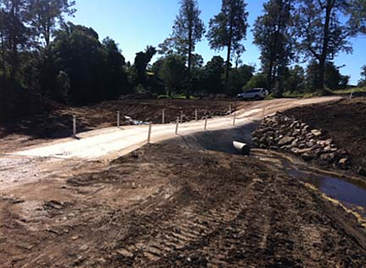 Following the devastating floods of January 2011, RDS was one of the first contractors invited by the Lockyer Valley Regional Council (LVRC) to assist with the clean-up and repair of the flood damaged infrastructure and roads in the region. With very little direction by way of plans and specifications it was left to those in LVRC and RDS to decide the best course of action to repair the damage we were presented with in the best possible manner and in the most time and cost effective way. The knowledge and experience gained in our 35 plus years of operation was tested to its limits. The destruction we were presented with was enormous, and the priority was to re‐establish vital road networks to link the community back together. 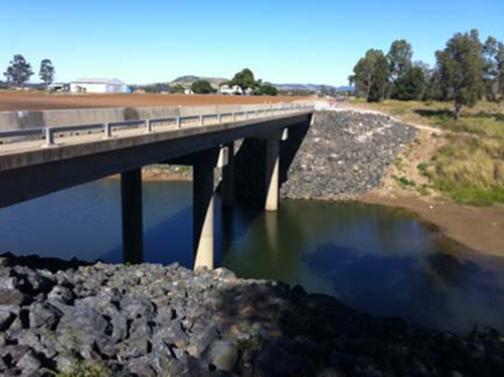 Of major concern was to repair and or replace the bridge and floodway network so the community was no longer isolated by creeks and watercourses and then systematically set about repairing damaged roads. RDS mobilised onsite on 27 January 2011 and remained a preferred contractor by LVRC in the continuing repair and replacement of the damaged infrastructure until project completion in December 2013. In the initial emergency period RDS undertook rectification works to over 70 roads and 10 bridges which ranged in scope from simple table drain clean outs and land slippage repairs to full road reconstruction. After July 2011 works were carried out under separate AS 2124 contracts for each road affected by the floods. The relationship between LVRC and RDS was one in which road construction skills and knowledge were mutually recognized and the works were undertaken at a pace to provide a stable and constant team of skilled personnel on site for the duration of the works.